Ubuntu Linux, Day 23: Would You Like Some Wine With That? There are some hurdles to cross before I can immerse myself in Ubuntu Linux. Just FYI--this post was written split between the two. I used Libre Writer to do most of it, while I worked in Ubuntu and captured screenshots. It seems like a capable enough word processor at first glance. We can dig into that more another day. But, I don't yet have a solution in place in Ubuntu that lets me connect with the PCWorld VPN, so I had to switch back to Windows to finish and post this. We'll try and tackle the VPN issue someday soon and we'll see how that goes. 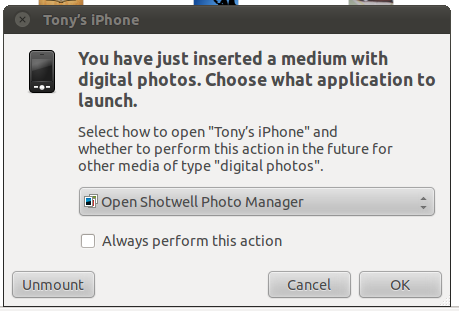 Ubuntu communicates with my iPhone at least enough to detect the photos.